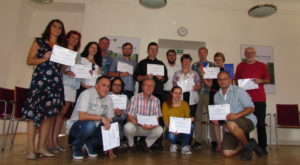 As part of the Decisions and Dilemmas 3: making learning about the EU motivating and meaningful project, the fifth national training event was held in Prague, the Czech Republic, on 14 and 15 June 2018. The training had as its title “We study and teach – EU” (Učíme (se) o Evropské Unii). The training kicked off in the afternoon of Thursday 14 June. 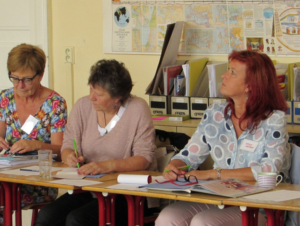 Following an introduction, the first workshop was called “How do we teach about the EU?” Discussions were held with the participants concerning how to approach the topic of the EU, and what teachers and students think about this subject in the classroom. The argument was made that extensive material exists to assist teachers on the subject, and this raises the question as to why teaching about the EU is still such a hot topic. Next, Eva Zajícová addressed the need to discuss the approach of the EU as a subject in schools, and subsequently she gave an overview of some of EUROCLIO’s previous projects and results while explaining the Historiana website. In the light of Historiana’s database, many participants expressed that the usage of English materials does not pose a problem for them. However, others exclaimed that there is the possibility of a language barrier. That is mainly why ‘Decisions and Dilemmas 3’ aims to provide teaching materials about the EU in several languages. These materials can be downloaded from Historiana’s website and adapted to the teacher’s and student’s needs. Participants proposed to introduce EU teaching in primary schools at an earlier stage, in this way including younger pupils, and by means of incorporating the topic into projects. The classical way of teaching is rather dry and not effective, participants argued, and thus other, innovative, ways of teaching about the EU should be used. Finding “real” situations, speaking about values, and addressing relationships were examples mentioned in the session. Even the usage of an internet game was mentioned but this gadget has to be revised and updated in order to be used as an educative tool in teaching pupils about the EU. Jiří Beneš led the next workshop on “Opening up Europe’s borders”. The participants were very enthusiastic about this workshop, as it provided a short game that encourages participants to reflect on their own background in relation to bigger social issues. Participants had to imagine the map of the Czech Republic and find the position of the town where they came from. Then, participants had to change positions to the location where their family is from and in this trend reflect on the topic of migration – were your parents/grandparents immigrants? Czech newspapers were used to complement this game by reflecting on articles about the wave of immigration that Europe faces today, and encourage debate among the participants. In this session, the recommendation came forward to use personal stories in order to generate a bigger impact. The second day of training started with a panel discussion moderated by ASUD President Pavel Martinovsky regarding “Global education and education in the European Context”. In this discussion, participants stressed that personal stories are very valuable in teaching history, as well as showing different viewpoints. Moreover, teachers should not be afraid to address controversial topics. In addition, the drama is a good method to teach history. The following workshop discussed “Rising from the Ruins: a scripted drama about the important steps leading to EU”, translated by Eva Zajícová, and presented by Croatian international trainer Igor Jovanović. During this workshop, a discussion developed that involved the usage of drama in history education, and participants proposed the idea of using only part of the provided script in order for pupils to find their own course of events, and eventually, their own conclusions. Regarding the viewpoint of Czech children on the EU, the participants concluded that the pupil’s opinions and views differ greatly from that of the older generation, as the EU has been a part of all the pupil’s life. They have not experienced border checks when going from one Schengen country to another. The participants suggested introducing them with this “unknown” and “inexperienced” part of Czech history in order to understand the situation prior to the EU, and thus understand the value of the EU today. Educating students can also lead to a wider dissemination of EU education in the form of talks and discussions with parents or other family members. The participants expressed great contentedness regarding the two-day training. Fruitful discussions, the expansion of networks, and the opportunity of applying new teaching techniques were some of the aspects valued most by the participants. 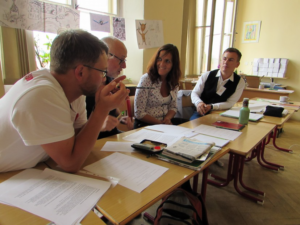 The national training event was organized by the History Teachers Association of the Czech Republic. This article is based on the report written by Eva Zajícová.